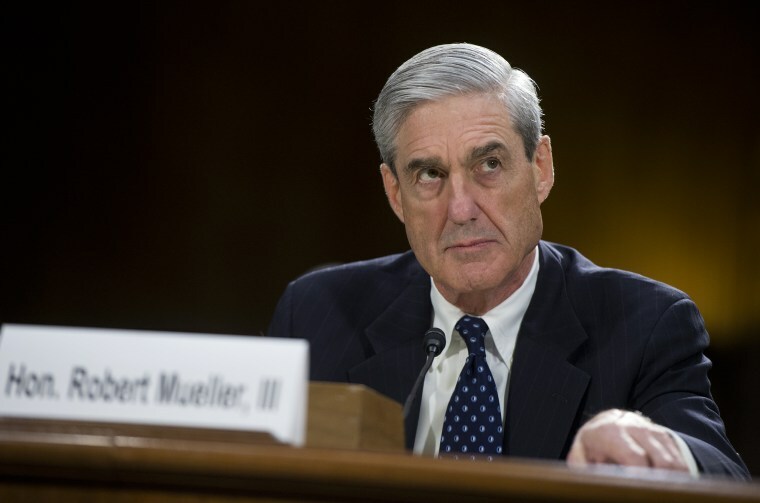 WASHINGTON — In the latest NBC News/Wall Street Journal, special counsel Robert Mueller is viewed positively by 28 percent of Americans, versus 19 percent who view him negatively (+9) — which is essentially unchanged from Mueller’s 28 percent positive, 21 percent negative score (+7) in January’s poll. By comparison, Ken Starr’s fav/unfav in the Sept. 1998 NBC/WSJ poll — as the Starr Report was being released in the Monica Lewinsky investigation — was 25 percent positive, 49 percent negative (-24). Inside the numbers of the current NBC/WSJ poll, Mueller remains popular with Democrats and above water with independents — but not surprisingly, he’s unpopular with Republicans. So over time, Mueller has gotten more popular with Democrats, less popular with Republicans, and it will be interesting to see if March’s dip with independents continues. Actually, he’s now 0-3 for candidates he’s backed and campaigned for in the last three contests — Luther Strange in the AL SEN runoff, Roy Moore in the AL SEN general and Saccone in PA-18. In case you missed them, here were yesterday’s midterm developments that we chronicled on our “Rundown” blog: The AP called the Democratic primary in IL-6 for scientist Sean Casten, who narrowly defeated Kelly Mazeski… Mississippi Gov. Phil Bryant’s pick of Cindy Hyde-Smith to fill retiring Sen. Thad Cochran’s seat has made things a little messy for the GOP… And Illinois’ gubernatorial primary – the Dem and GOP contests – was the most expensive non-presidential primary in history, according to Advertising Analytics.